Clovis spearpoints, named for Clovis, N.M., where they were found among the bones of mammoths, represent the epitome of North American Stone Age weaponry. They tend to be large, finely crafted and made from high-quality flint. Although they were long thought to be specialized mammoth-killing weapons, new research suggests they were more like general purpose Boy Scout knives. If Clovis points were specialized tools designed specifically to kill big-game animals such as mammoths and mastodons, then the special kinds of flint used in their manufacture along with the exquisite craftsmanship simply might have been practical necessities for producing a reliable instrument used to kill big game. 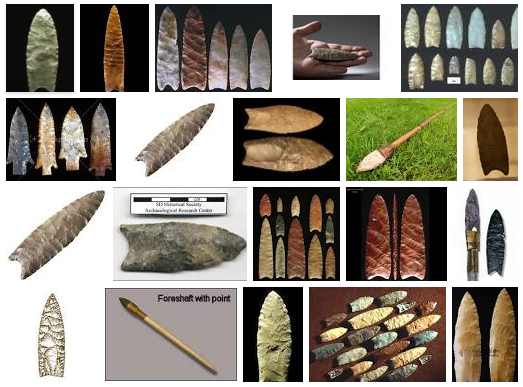 It also is possible that the special qualities of Clovis points were due to ritual practices the makers believed would help to ensure the success of high-risk hunting ventures. Clovis points certainly were used at times to kill both mammoths and mastodons. In addition to the original site, Clovis points have been found at 11 other sites with mammoth remains and two sites with mastodon bones. Nevertheless, some doubt was cast on the idea that Clovis points were made expressly to kill mammoths and mastodons a few years ago when Mark Seeman, who was a Kent State University researcher, and colleagues identified blood residue from rabbits on Clovis points from the Nobles Pond site in Stark County. Now Logan Miller, an Ohio State University graduate student studying archaeology, has observed microwear traces on a Clovis point from the Paleo Crossing site in Medina County. His results, which indicate the tool was used to cut soft plants, were recently published in the journal Lithic Technology. Using high-power magnification, Miller examined a sample of 10 stone tools, including two Clovis points, and identified a variety of polishes that are indicative of different uses. This microwear reveals both the ways in which the tools were used, such as cutting versus scraping, and also the type of material on which they were used, such as meat, hide, bone or soft plant. Miller reported that one of the Clovis points exhibited “linear striations near the tip” — the type of microwear pattern you would expect to find on a spearpoint used to kill an animal. Unfortunately, the microwear can’t tell us whether that animal was a mastodon, a rabbit or a deer. The other Clovis point had two kinds of microwear on its sides and edges — a “dull greasy polish,” which indicates that it was used to cut meat or fresh hide, and an overlay of a “very bright, smooth polish,” which indicates that it was last used to cut soft plant material.Finding evidence that a Clovis point was used to cut soft plants does not necessarily mean that Paleoindian hunters were stalking wild asparagus. The point might have been used to process plant fibers to make cordage or basketry. Nevertheless, it does suggest that far from being specialized mammoth-hunting weapons, Clovis points were the equivalent of Paleolithic all-purpose utility knives. Such a versatile tool would have been handy for hunter-gatherers, who had to carry all their possessions around with them as they roamed across their Ice Age world.